Microsoft Dynamics GP has successfully helped small and mid-size businesses who want to automate and streamline their business management processes. 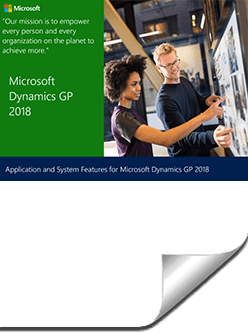 Specific areas of the product were enhanced in Dynamics GP 2018 and Dynamics GP 2018 R2. Existing functions were improved and enhancements were made to the user experience to make finding the information you need to make business decisions faster and easier. Monthly Recurring Batches – You can now automatically set the posting date for monthly and bi-monthly recurring batches in Inventory Management, Payables, and Receivables to end on the last day of the month. Transaction Level Post Through G/L – Posting Setup has a new option to allow transactions to post through the general ledger if marked to post through. Duplicate Check Numbers – In the Checkbook Maintenance window, there is a new duplicate check numbers field. When the field is cleared, Dynamics GP will prevent the use of a duplicate check number. Exclude Inactive Checkbooks in Lookup – The default checkbook on batches has been simplified. Users now have a choice to exclude and not see inactive checkbooks. Bulk Updates of Master Records as Inactive from Navigation Lists – When selecting one or more master records on a navigation list, a user can inactivate or reactivate the record(s). Print a single statement from customer maintenance – A statement can now be printed for a single customer from the Customer Inquiry window for that customer. The format used will be the one that has been assigned in the Receivables Set-up window. One Payment per Invoice Set or One Payment per Vendor – You now have the choice to make payments on individual invoices or choose a single payment per vendor. The default setting will generate a single payment per vendor when you build payment batches using the Build Payment Batch window. Save Select Payment Settings – An option that gives you the ability to save the settings you used to build a payments batch has been added to the payment option ID field in the Build Payment Batch window. Copy User Access across dimensions in Analytical Accounting – You can specify the users who have access to dimensions and copy their access settings from one user to another in the User Access to TRX Dimensions window. Payables checks windows renamed – To reflect the ability to make payments using alternate payment options such as credit cards, electronic funds transfers, and other methods, the Payables Management Checks windows have been renamed. Payroll Check Register FICA totals – in earlier versions of Dynamics GP, the employee Medicare and employer Medicare values were totaled separately. Now, the payroll check register report has FICA totals for both the employee and employer. Start and end dates for pay codes – A start date and/or an end date can be assigned to pay codes in the employee maintenance window. This ability is especially useful when you are activating a new hire or terminating an existing salary employee. Shared Maximums for Benefits and Deductions – You can now assign a shared calendar year maximum for groups of benefits and/or groups of deductions. If your organization has employees who contribute to two 401(k) plans, this capability will be a huge benefit to your organization. Roll down payroll set up options from set up to in active records – you can now roll down changes to in active employee records there are several options included in this feature such as changes to: pay codes, deductions, benefits, and shift codes. Turn off garnishment reports in posting set up – You now have additional controls for printing garnishment reports in the posting set up in payroll. Selections include printing garnishment detail or summary reports when you complete a pay run. Change the department code in all data tables – Users can now be given the ability to modify an existing department code and changes will automatically update all of the tables containing that department code. Restrict in active deduction and benefit codes and look up Windows – You will be able to restrict the inactive records in look up windows on a per user basis. Restrictions can be set on company benefits and deductions and employee benefits and deductions. Advanced wellness and health insurance integration – Actions such as refraining from smoking or maintaining membership in a gym or health club can now be tracked as employee actions that contribute to lower insurance premiums. New Sales Transaction Approval Workflow – Approvals can be created based on several conditions such as when a customer credit limit is exceeded on the transaction. Workflow approval can be set based on customer credit limits and on all transaction types in Sales Transaction Entry. Reminder emails – You can now set a reminder time period on the workflow that’s used to notify users if they haven’t taken action on their assigned workflow task within a specific timeframe. Copy Workflow Step -the process of setting up workflows has been made more efficient by giving you the ability to copy steps within a workflow. You can rename the step and include sub-steps to a workflow. Reporting for workflow – A new workflow history report is available in GP 2018. You can filter the report by workflow type, approvers, status, and approval date. Additional fields available for payables transaction workflow – By marking the extended fields list option in the Work Maintenance window and selecting the fields you want to use in the Workflow Condition Editor, you can use new fields such as: vendor account, comments one and two, vendor class ID, and payment priority. Additional messages for purchase order workflow – You can add account descriptions to workflow messages distributed by email for purchase order workflows and purchase requisition workflows. Bank used for EFT added to vendor approval workflow – information showing the bank of vendor uses for electronic funds transfers is now included in the vendor approval workflow. EFT information that can be included are: country, bank name, bank account, and SWIFT code. Workflows for new accounts, receipt transactions, and purchasing invoices – to control the addition of general ledger accounts, purchasing invoices, and purchase receipt transactions new workflows have been added. Maximum Password Length – The maximum length for user passwords has been increased from 15 characters to 21 characters. This change will allow more complexity with GP user passwords and will add more security to your Dynamics GP environment. Password expiration notification – Users will be provided with a notification seven days in advance of their login password expiring. They will be able to proactively update their passwords before the expiration date specified in the password policy configured by the system administrator. Hide Business Analyzer and Navigation Lists for all users and all lists -The Business Analyzer for the Home Page and/or navigation lists can now be turned off by system administrators at the system level in the System Preferences window. These settings are global to make it easier to turn off the feature if a company is not using Business Analyzer. Smartlist Designer favorites display and navigation lists – if a Smartlist favorite is created using Smartlist Designer, it will now appear in the Smartlist Favorites navigation lists. Intelligent Edge – intelligent Cloud Insights – A new tab has been added to the home page called Intelligent Cloud Insights. Your Dynamics GP can be connected to a Dynamics 365 Business Central cloud tenant and the data can be synchronized. Login remembered when working in system manager – The system password only needs to be entered once during an active session when working in multiple system windows. Comprehensive document attachment – The document attachment capability available from the ribbon in additional transaction entry windows has been broadened to include additional master record windows, inquiries, and transaction entry windows. Retain Ship-to-Address Name with Customer Modifier – When using the customer modifier and combiner utility to modify a customer, the ship-to-address name is retained. New Smartlist for Deposits Associated with Unposted Sales Transactions – Deposit amounts associated with unposted sales invoices and orders can be easily viewed through the new Deposits on Unposted Sales Transactions Smartlist. Additional Sort Options in Sales Order Processing Item Inquiry – A new field has been added to give you the ability to change the display within the scrolling window with sort options. Sales Order Transaction Navigation List – Print Document option for Functional or Originating Currency – You can now choose to print a document in the originating or functional currency from the Sales Order Transactions Navigation List window. Print and Email Documents at the same time – The ability to print and email sale documents at the same time has been added in three areas. Instead of using two separate actions to print the documents and then email them, you can now print and email sales invoices in one process. Email customer statements – Customer statements can now be emailed with the click of a button. The new email button can be found on the menu bar of the Customer Maintenance window. Checkbook ID Defaults on Computer Check Batch – A default can be set up in the Payables Management Setup Window to be shown automatically when a check batch is created in the Select Payments, Edit Payment Batch, and Batch Entry windows. Allow Partial Purchase on a Purchase Requisition from a Purchase Order – When creating a purchase order from one or multiple purchase requisitions, there’s an option to purchase a lower quantity than what was indicated on the initial request in the Purchase Order Preview window. Add Vendor Document to Purchasing All-in-One View – The vendor document number is usually more known by users than the document number when accessing the Purchasing All-in-One Document view. For easy reference, the vendor document number has been added in the payments and credit documents columns. Send a Purchase Order Using Another Template – A new option has been added to the purchase order entry and purchase order inquiry zoom Windows. You can now choose to send a purchase order as an email using the format “Other Format”. Warning when the vendor is on hold – You will now get a visual indicator when you are entering a payables transaction for a vendor that is marked as on hold. Purchase order generation list opens with newest PO’s – Purchase orders created from the Purchase Orders Preview window using the Generate button can be displayed in the purchase order transaction lists. When using the Generate button, the PO navigation lists will open automatically with the newly generated purchase orders displayed first. PO information displayed for requisition originator – If you create a purchase order from a requisition, the requisition list will display the PO information to ensure that the requisition originator is aware that the items on the requisition have been ordered. Print purchase requisition – A purchase requisition report can now be printed from the Requisition Entry and from the Requisition List windows. Display hold status in the sales transaction entry – Transactions that have a hold status can now be displayed from the Sales Transaction Entry and Sales Transaction Inquiry Zoom windows. Shortcut to Smartlist has been added to the web client – Navigation to the Smartlist can be done directly from the web client. This enhancement makes access to Smartlist inquiries and reports easier and faster. Auto – complete now included in the web client – Recognition of partial entries and fields is a functionality that is now included in the web client just as it is in the desktop client. One – Click navigation to Smartlist from web client -The banner in web client windows now has a shortcut providing one click navigation to Smartlist for those users who have been granted access. OData Version 4 Support: Support has been added for OData version 4 and the GP OData service now includes paging and filtering. Explore Microsoft Dynamics GP 2018’s new features and enhancements in greater detail in this downloadable whitepaper. 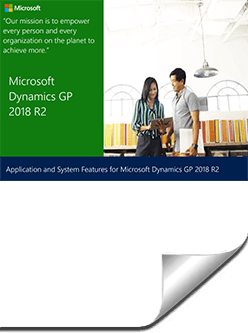 Explore Microsoft Dynamics GP 2018 R2 in greater detail in this downloadable whitepaper.